Coda: Use your tools and enjoy the ride! Our mission was to unleash the product skills in everybody. This is why we launched The Product Book on Product Hunt. Learn how we made it! It can be hard to earn a place in the spotlight in today’s tech scene. With new products being launched every day, the competition is fierce. Product Hunt is a platform dedicated to displaying and organizing these launches in a simple way. Thus, developers, investors, and the general public become acquainted with the latest innovations through a quick glance at the page. Product School is focused on building the next generation in products and product people. Clearly, we had to be there. But if we were going to launch on Product Hunt, we needed to do it right. The Product Book is the ultimate Product Management manual. It was written by Carlos González de Villaumbrosia (Product School CEO) and Josh Anon (CEO of Visioneer Studios, former Pixar PM). Unlike many of the PM books and online guides, this one was based on actual experiences. Carlos has spent the best part of a decade exchanging insights and impressions with the best minds in product management from Google, Facebook, Amazon, and others. As you know, our mission is to spread the word about great product management. There is so much confusion out there about the role. In the past, our readers and alumni have told us that the Book helped them get rid of their mistaken assumptions and launch their product careers. Then, it was decided. 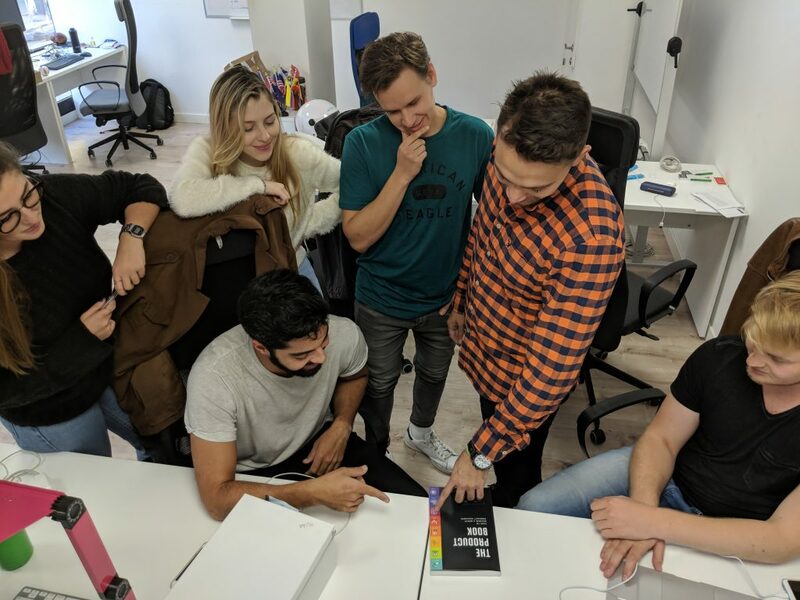 We had to get the Product Book on Product Hunt. And become the most voted product. Here’s what we did to make it possible. Sending a coherent message is a fundamental requirement for a successful Product Hunt launch. Here at Product School, we wear many hats. We’re educators in product management, data analytics, digital marketing, blockchain, and coding. We’re events organizers: every week, leading professionals deliver presentations on expert topics across the globe. And, of course, we can’t forget about #ProductCon, the biggest conference in the product arena! We needed something to encapsulate this diversity. 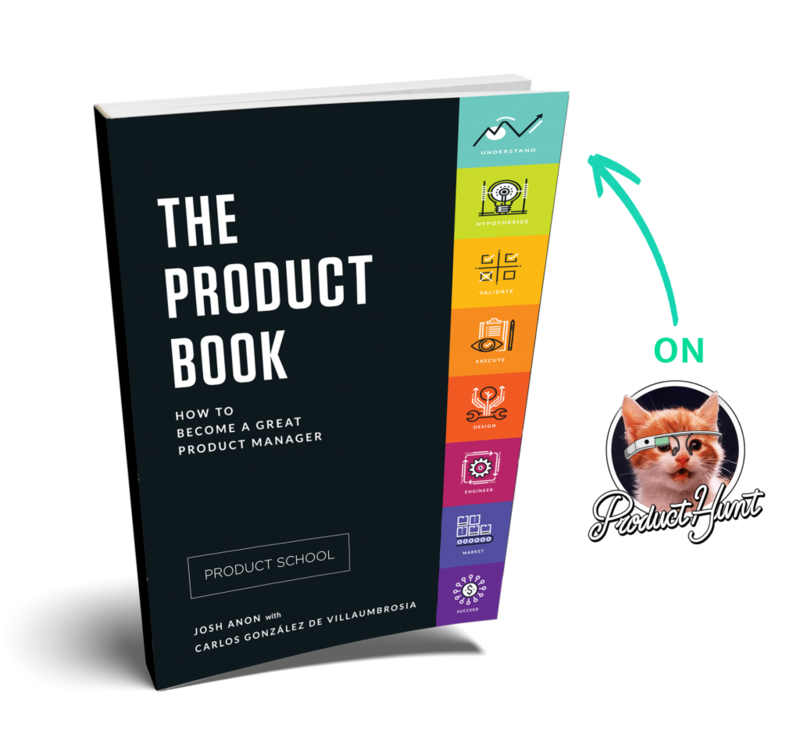 The Product Book, more than anything else, seemed like the perfect fit for Product Hunt. First, it’s something that was already a hit, having spent several weeks as an Amazon bestseller. Secondly, it was easily shareable content. As the most exhaustive Product Management manual, The Product Book’s e-book version had already been downloaded thousands of times. Aspiring and acting PMs had shown it to colleagues and friends. Finally, the book was connected to the deeply personal story of CEO and founder Carlos Villaumbrosia. As an aspiring technologist, Carlos had always wanted to make a product that everybody would love. After setting up two successful educational startups, he now leads Product School to share with others what he learned along the way. 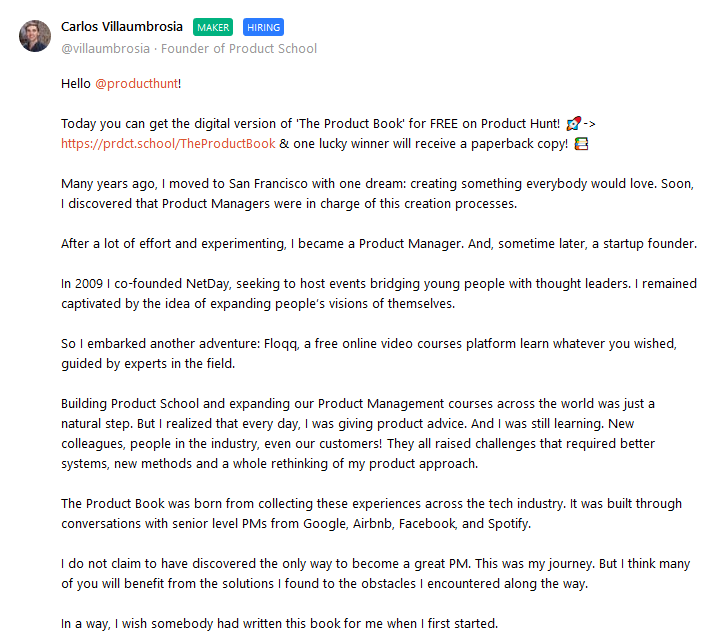 Thus, Product Hunt users could see that the journey and the book were not just “products”, but belonged to Carlos’ life story. You can’t go to the Moon without proper training way before launching your rocket. NASA spends years, even decades, preparing a mission. We probably can’t rely on having the same time window. Memorize Product Hunt. You need to get yourself familiarized with the general feel of product submissions. Most likely, you will notice that they employ carefully selected pictures and videos, include links with additional information, and have a coherent display of different texts: a product description, the maker’s comment, etc. By the way, did you know that Product Hunt lets you create a landing page to start gathering subscribers before you launch? Check out ours for inspiration! Pro tip: don’t use “flashy/rapid” gifs because the Product Hunt team will remove it. Make sure to slow down your gif before using it. Prepare all copies in advance. We can’t stress this enough. While a certain degree of adaptability and improvisation can benefit your project, you’d better be prepared! If you manage to compile all the necessary text you need for the descriptions, the maker’s comment, your social media campaign… you’ll save a lot of time on launch day. Activate all your channels. This might seem obvious. Don’t you do this already when you’re embarking on any promotion? Yes and no. Product Hunt success requires that you think beyond the ordinary. In our case, our Slack community was particularly helpful in spreading the word. Who knows? Maybe your personal LinkedIn account has those few special connections that can make or break the campaign. Reach out! It’s fundamental to distribute your content across all social channels. 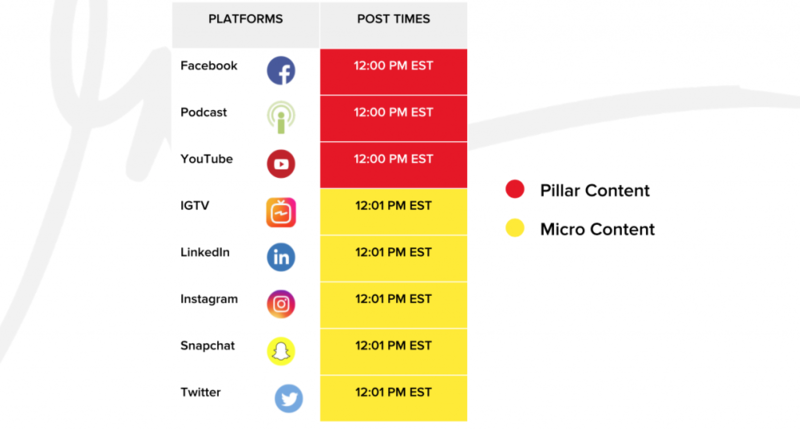 We covered every platform from Instagram IGTV to Meetup communities to LinkedIn! A little organization can be of great help, start by creating an excel sheet with all your channels and specific post times and then start spreading the message. Don’t build a campaign around the launch. Make your launch to build a campaign! This is a fundamental principle. What is your Product Hunt goal? Is it simply gaining more exposure? This might be too broad. You need to define a target which is precise and helps you get to the next stage. In our case, we sought to link our CEO’s life story, The Product Book and our current course offerings through the campaign. This way, our online community and new followers on Product Hunt could see that we’ve been in the game for a long time. Additionally, of course, the snowball effect from becoming the most voted product would help us gain new followers and, eventually, leads. Check your systems & prepare for any eventuality. Brief but important point. Sit down with your technical team and ensure that all your systems are in place. If your campaign is successful, your website will receive more traffic than usual! Also, you can have some technical errors. It could be a matter of numbers, such as having too many requests and too few people to answer them.You should be ready for things to go sour. Ensure that you are ready to answer the toughest questions. And check all the items on this list! In any case, predict, prepare and be connected for 24 hours to solve any problem! All hands on deck. Even in small organizations, there’s a tendency to divide the work between teams and discrete tasks so as to be as efficient as possible. This is not the case. Make sure that all your teams are aware of the campaign. It’s not just a marketing matter! Probably, the most productive hacks will come from team members in other departments. They haven’t been involved in every single campaign, so it’s likely they will have something to bring to the table. Bring ’em all in! On launch day, if you have followed the list above, you should be more than ready. We were lucky to have unprompted but very welcome endorsements by tech influencers. Even if you’re not as lucky as we are, make sure that all of your interactions follow similar guidelines. Product Hunt is an external platform, so you’re not in control. It’s possible that you’ll receive some negative feedback. Of course, this is not a good thing. But keep your cool. If you manage to answer in a positive way, others will notice. If you have made a mistake, apologize! If you think that the person misunderstood you, show them why! Every positive interaction on Product Hunt or social media channels will help you increase visibility and send good vibes at the same time. Did you achieve the goal? If you didn’t, don’t despair! First, wait a couple of days. 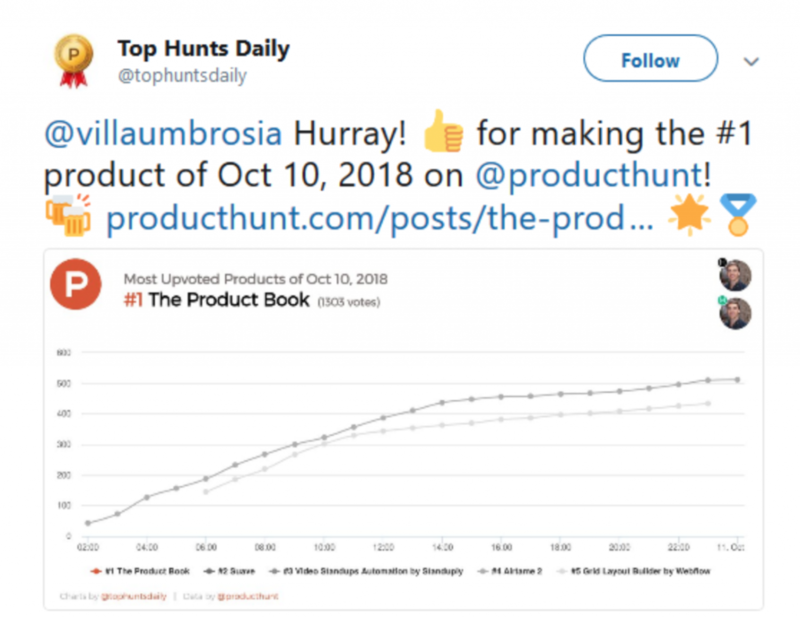 While The Product Book became the most upvoted product of the day, it later also became the third featured product of the week. This means that you could still become a product of the week. Also, don’t forget that the process itself is full of positive, small targets that increase growth. Probably, you worked harder at increasing your communities and social media following. You drove additional traffic to your website and enlarged attention to your product. Your own assessment should bring out the positives. Of course, make sure that you understand why you failed to achieve your goal and do better next time! If you achieved it, hooray! You’ve probably realized that a Product Hunt launch brings a lot of unexpected benefits. Besides the additional exposure, it has possibly helped you attract new users, redefine your voice for a different audience and gather direct leads. Ensure that you understand your success and compile this vital information for future campaigns. In the case you’re feeling generous, why don’t you share what you learned with the rest of the community? This is what we’re doing right now! We learned one thing during this campaign: pour your heart out and be true to your project. The Product Book was a labor of love, seeking to unleash everybody’s PM skills. Find that labor of love and your campaigns should be as (or more!) successful than ours! 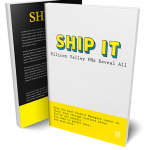 Check The Product Book on Product Hunt and get your free copy today!